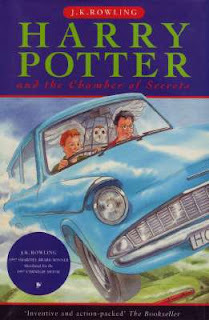 This is book 2 in the Harry Potter series and was published in July 1998. Published by Bloomsbury, the First Edition print run was ten thousand one hundred and fifty copies. The First Edition hardback has the full number line of 10 down to 1 on the copyright page. It was issued with a dustwrapper illustrated by Cliff Wright, with a retail price of £10.99. This book has illustrated boards which matches that of the dustwrapper. The front wrapper and board show a blue circle indicating a 1997 Smarties Award winner and Carnegie medal shortlisting. The black band along the bottom should read “Inventive and action packed - The Bookseller"
Though the number of First Edition’ is greater than that of Harry Potter and the Philosopher’s Stone, it was still a very low print run by today’s standards and thus remains highly collectible.